Home › Promotions › Mother's Day Spa Day Give-A-Way! 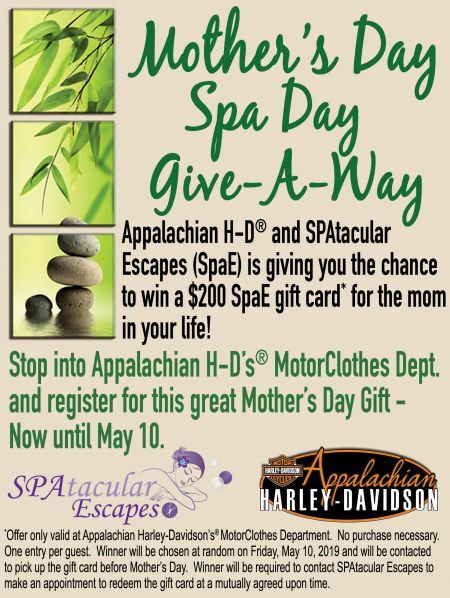 Appalachian H-D® and SPAtacular Escapes (SpaE) is giving you the chance to win a $200 SpaE gift card* for the mom in your life! Stop into Appalachian H-D's® MotorClothes® Department and register for this great Mother's Day Gift - Now until May 10! *Offer only valid at Appalachian Harley-Davidson’s® MotorClothes Department. No purchase necessary. One entry per guest. Winner will be chosen at random on Friday, May 10, 2019 and will be contacted to pick up the gift card before Mother’s Day. Winner will be required to contact SPAtacular Escapes to make an appointment to redeem the gift card at a mutually agreed upon time.